Ford is having a bad year in 2018. 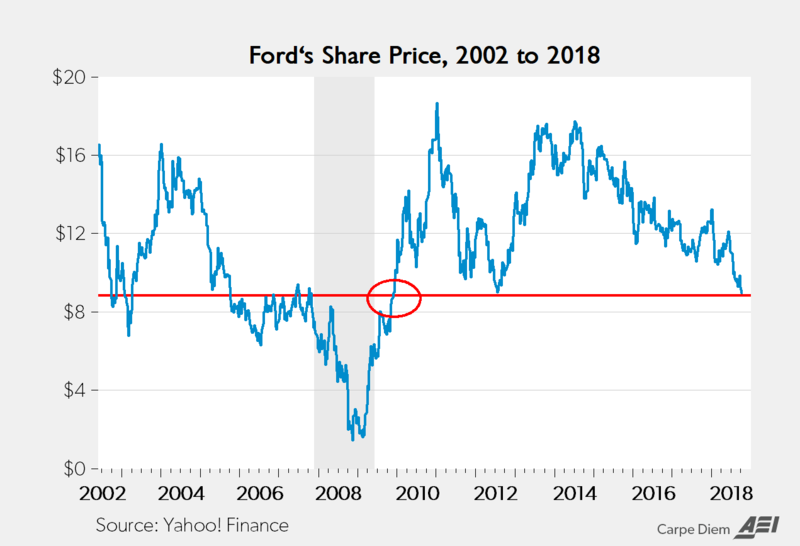 Its stock is down 29% (see top chart above vs. +4.8% for the overall market year-to-date and bottom chart showing Ford’s stock price now at an 8-year low, the lowest level since the fall of 2009), and the tariffs imposed by President Trump have reportedly cost the company $1 billion, as the company is in the midst of a reorganization. Now, the company is announcing layoffs. Jim Hackett, Ford’s CEO, is working to engineer a $25.5 billion restructuring of the automaker, hoping to cut costs and remain competitive. But auto sales are down, and one reason is the trade tariffs that Trump has imposed on metals and other goods. Hackett has said they have already cost the company $1 billion in profit and could do “more damage” if the disputes aren’t resolved quickly. Related: New York Times article “Trump Claims Trade Victories but Businesses Struggle Under His Approach” provides many more examples of how Trump’s “winning” is putting US businesses, farmers and workers at great risk of collateral damage from the Trump trade war.